In Sony Pictures Animation's THE STAR, a small but brave donkey named Bo yearns for a life beyond his daily grind at the village mill. Bo (Steven Yuen) and Dave (Keegan-Michael Key) in Sony Pictures Animation's THE STAR. Ruth (Aidy Bryant), Bo (Steven Yeun) and Dave (Keegan-Michael Key) in Sony Pictures Animations' THE STAR. Ruth (Aidy Bryant), Dave (Keegan-Michael Key), Bo (Steven Yeun), Joseph (Zachary Levi) and Mary (Gina Rodriguez) in Sony Pictures Animation's THE STAR. 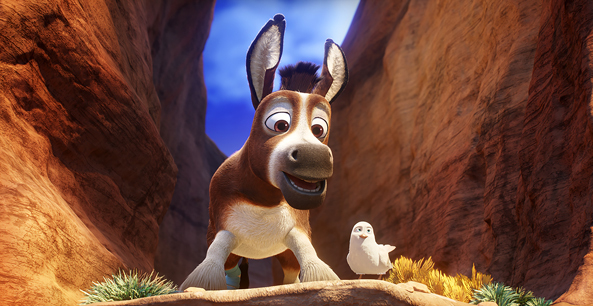 Joseph (Zachary Levi), Mary (Gina Rodriguez), Bo the donkey (Steven Yeun), Dave the dove (Keegan-Michael Key) and Ruth the sheep (Aidy Bryant) in Sony Pictures Animations' THE STAR. Deborah (Oprah Winfrey) with Mouse (Kristin Chenoweth) in Sony Pictures Animation's THE STAR. Animal friends celebrating Bo (Steven Yeun) in Sony Pictures Animations' THE STAR. Felix (Tracy Morgan), Deborah (Oprah Winfrey) and Cyrus (Tyler Perry) in Sony Pictures Animations' THE STAR. Bo (Steven Yeun) and Ruth (Aidy Bryant) in Sony Pictures Animations' THE STAR. Mary (Gina Rodriguez) with Dave (Keegan-Michael Key) and Bo (Steven Yeun) in Sony Pictures Animations' THE STAR. Felix (Tracy Morgan), Cyrus (Tyler Perry) and Deborah (Oprah Winfrey) in Sony Pictures Animations' THE STAR. Dave (Keegan-Michael Key) and Bo (Steven Yeun) in Sony Pictures Animations' THE STAR. Dave (Keegan-Michael Key) in Sony Pictures Animations' THE STAR. Mary (Gina Rodriguez) and Joseph (Zachary Levi) in Sony Pictures Animations' THE STAR. Bo (Steven Yeun) and Dave (Keegan-Michael Key) in Sony Pictures Animations' THE STAR. Leah (Kelly Clarkson) in Sony Pictures Animations' THE STAR. Edith (Patricia Heaton) in Sony Pictures Animations' THE STAR. Abby (Kristin Chenoweth) in Sony Pictures Animations' THE STAR. Ruth (Aidy Bryant) in Sony Pictures Animations' THE STAR. Bo (Steven Yeun) in Sony Pictures Animations' THE STAR. King Herod (Christopher Plummer) in Sony Pictures Animations' THE STAR. Felix (Tracy Morgan) and Cyrus (Tyler Perry) in Sony Pictures Animations' THE STAR. Bo (Steven Yeun), Mary (Gina Rodriguez) and Joseph (Zachary Levi) in Sony Pictures Animations' THE STAR. The Three Wise Kings including Caspar (Joel Osteen, center) in Sony Pictures Animations' THE STAR. Joseph (Zachary Levi) and Mary (Gina Rodriguez) in Sony Pictures Animations' THE STAR.